Three teachers and a school secretary are the Emporia Public Schools most recent Hopkins Award recipients. 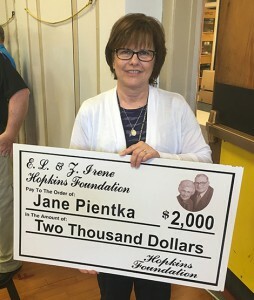 Jane Pientka, secretary at Walnut Elementary School, received an award this afternooon at a surprise assembly at her school. 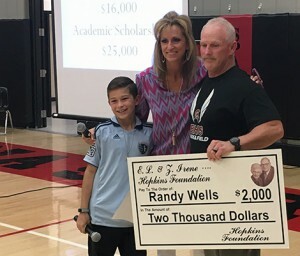 Later, Hopkins awards were presented to Randy Wells, an Emporia High School physical education teacher, and Erica Huggard, EHS science teacher. 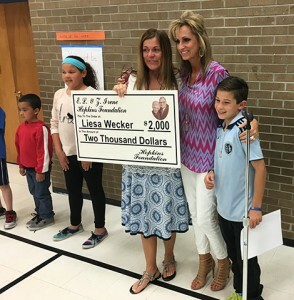 The final award was presented to Liesa Wecker, kindergarten teacher at Logan Avenue Elementary School. All four honorees received $2,000 cash awards from Michelle Hopkins-Molinaro, vice president and managing director of the foundation. Each employee also will receive another $1,000 to spend on something to benefit a specific school or district program. 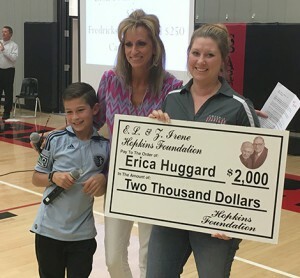 With today’s awards, the Hopkins Foundation has given approximately $387,000 to 194 teachers and support staff members in the Emporia schools since the inception of the awards in 2002. The awards program was a dream of Molinaro’s grandfather, E.L. Hopkins, as a way to reward educators. Hopkins Award nominations can be submitted anytime during the year by parents, student and staff. An online nomination form is available on the district website. A selection committee meets at least quarterly to review nominations and select winners. Innovation/Initiative/Simplification that demonstrates leadership or participation in a project or process of improvement that aligns with the district mission and/or streamlines operations. Collaboration as one team, school or district that demonstrates an outstanding commitment to teamwork by thinking creatively, removing internal boundaries and communicating effectively. Noteworthy Service that is extraordinary and exceeds expectations. Inspiring others to try new things or excel in new ways. Commitment to excellence in any endeavor that enhances the workplace and creates a positive work environment and culture of learning.